In 2007, Dharmadasa and Sumanawathie, his wife, were the proud but exploited owners of a small, mud walled ‘factory’ in which they produced pappadam, the crispy accompaniment to rice & curry that is popular in Sri Lanka. In their modest facility they produced pappadam which was sold in bulk, giving them a small profit of one rupee per packet. Then they met the MJF Foundation Small Entrepreneur Programme team. Today, with the assistance of the MJF Foundation within the Local Heroes programme, Dharmadasa has a brand new factory, new machinery to replace the slow, manual process of the past, solar energy, and his own brand. The Foundation with volunteers from Dilmah provided guidance, funding, advice on business management, hygiene and food technology, whilst also building Dharmadasa a new factory and finally designing for him his own brand – Shakthi (meaning strength). Shakthi is much more though because volunteers from the Dilmah Marketing Team worked with Dharmadasa in developing new types of pappadam. Over 12 months after the new factory was constructed, new recipes were tested and for the first time in Sri Lanka, a high fibre Kurakkan (millet) based pappadam developed. Variants were also developed with chillie flakes, Karapincha (curry leaf) and in a different shape, suitable as a ‘bite-sized’ snack. The Foundation Local Heroes initiative is an evolution of the small entrepreneur programme where the Foundation strives to support and empower rural and underprivileged communities to conduct sustainable livelihoods. D. M. Dharmadasa residing in the impoverished yet beautiful province of Monaragala was the first beneficiary to enter the more advanced Local Heroes programme. By assisting him to develop his small papadam factory the Foundation sought to create demand for the local farmers in the area who provide Dharmadasa the raw material for his produce. Through the project the MJF Foundation also seeks to provide employment for differently abled people from the nearby Kumbukkana Deaf & Blind facility. Importantly the Foundation hopes to build confidence and therefore hope amongst people in the area that in spite of their isolation, they can succeed on a national scale. The story of Shakthi pappadam has become an inspiration to people in the area; it is the first time a brand from the community has ever gone beyond the region and taken on national significance. On 27th June 2009 the Foundation team together with Trustee, Dilhan C. Fernando visited the small but well maintained factory of Dharmadasa to celebrate the commencement of production of the first kurakkan (millet) based papadam. 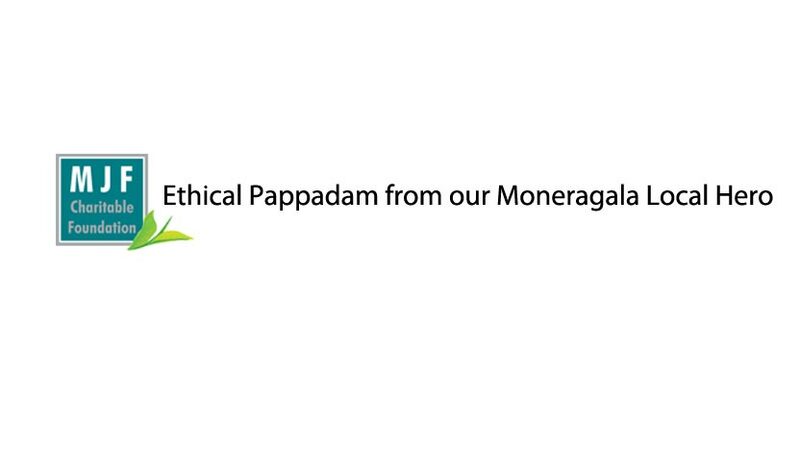 This healthier, ethically made product would be an alternative to the papadam products available in Sri Lanka. The production was then packed into the Shakthi branded packaging and the first batch was sold to Settlor of the MJF Foundation, Merrill J. Fernando on 16th July, 2009. Dilmah is assisting Dharmadasa to replicate the success that is embodied in the Dilmah Story – cut out the middleman and take charge of his destiny. The result is that this producer, whose passion and commitment were stifled by the low prices he was paid in the past, now receives ten times the profit he earned previously, and is able to innovate, and bring hope and prosperity to a remote and poor part of Sri Lanka. The Dilmah Sri Lanka Sales Team will help Dharmadasa gain entry with Shakthi pappadam into the retail market and will provide assistance in negotiation, pricing, marketing and merchandising. The entire proceeds will go towards developing Shakthi Pappadam further. Shakthi Pappadam will be served at Dilmah’s Ceylon Tea Trails and through a network of hospitality and retail partners in Sri Lanka, Dilmah would secure support for Dharmadasa. Embodied in the agreement that the MJF Foundation has entered into with Dharmadasa is the requirement that as his business grows, a portion of the profits are retained to make his business a matter of human service. That process has already commenced with Shakthi pappadam workers maintaining the neglected Home for Elderly Ladies in Moneragala. The contract further requires that as the business grows, more differently abled workers will be added to the 3 that are employed at Shakthi at present. With his increased profitability, Dharmadasa is also required to pay a higher price for the Kurakkan (millet) produced locally, thus helping the farmers. The Foundation also established village farmer societies to supply Dharmadasa with the raw materials required for his products thus helping them to improve their earnings. Currently the lack of a milling facility in Monaragala has compelled the farmers to sell their crop to middlemen at very low prices. In the next phase of the Local Heroes project in Monaragala the Foundation plans to establish a milling facility which will be handed over to the Farmer societies. The societies would be encouraged to adopt sustainable agricultural practices and would be provided the necessary resource training.